I would rely on wind to clean the panels, but if there was no choice but to use the arm or lose the mission, a more effective approach than scraping would probably be to use the arm to bump the panels a few times, hoping to dislodge dust and let it be carried away by the wind. Do it at the windiest time of day - we are getting that information - and hope for the best. But wind will do the trick without any help, I am sure. One of my university professors back in the day said that they really wanted to equip solar powered rovers/landers with air compressors or fans to blow the dust off but that would be a mass hit which NASA would rather spend on instruments. Mars could've given us a break, but it didn't. The HP3 mole started hammering itself today, and almost immediately (after just 5 minutes) appears to have encountered a rock. After four hours of hammering, it may have pushed the rock aside, but doesn't appear to have buried itself completely beneath the soil yet, because it's still measuring temperatures consistent with the Martian air temperature. No matter; they'll try again Saturday. Patience is the theme of the InSight mission. "The team has decided to pause the hammering for now to allow the situation to be analyzed more closely and jointly come up with strategies for overcoming the obstacle," HP3 Principal Investigator Tilman Spohn of DLR wrote in a blog post. He added that the team wants to hold off from further hammering for about two weeks. If you go there and click back through the images it looks like they are taking individual images of the horizon now, moving the arm a bit each time. So my guess is that this is part of the big panoramic image they want to take. Just the horizon bit of the panorama. There is approximately 1 full image missing from the full coverage of the horizon. Below, a stretched version to show subtle topography more clearly. The sinusoidal shape of the horizon is an artifact (not just due to tilt, it's an error in mosaicking). Is it possible for Insight's robot arm to sweep off the dust from the solar panels when power levels start to get too low? Is that something they considered when designing it? Might be worth a try at the end of primary mission when the reward is worth the risk involved in using the robot arm to clean the solar panel. It might damage the cells but if they don't try Insight will stop working anyway. It has no brush, so it couldn't do that if they wanted to. NASA considered solar-panel cleaning systems (compressed air, brushes, etc.) for the MER rovers, and decided they were not worth the weight. It was easier to just make the solar panels a bit larger in order to compensate for dust settling on the panels. InSight's solar panels are similarly designed so that even with some dust cover it will produce enough power to complete the primary mission. However, last I heard NASA was doing some research into a system which would create an electrostatic charge to push dust off of solar panels. It doesn't have any moving parts, doesn't require a lot of power, and could be run every few days to prevent dust build up. I do not know what the status of that is. Wow they really found a flat and boring bit of Mars. Although I think that's exactly what they wanted for this mission xD It's much less rocky than Viking 2's landing spot. #InSight in sight! 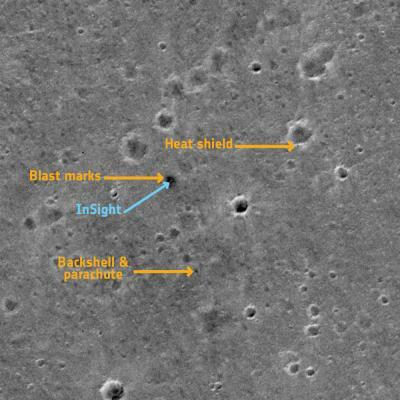 Among a new showcase of pics from the ESA/Roscosmos Trace Gas Orbiter (TGO) is an image of the NASA InSight lander – the first time a European instrument has identified a lander on the Red Planet. #Insight arrived on Mars on 26 November 2018 to study the interior of the planet. Images of the lander have already been returned by NASA’s Mars Reconnaissance Orbiter, but these are the first images from TGO. But watching the sunset over a vast, red, endless desert might be just as good. Especially when that desert is over 150 million miles away. Thanks to NASA's InSight lander, which has planted itself in Mars' flat, smooth plain Elysium Planitia, you can do just that. The image above was snapped by NASA's most recent Mars transplant on March 10, the robot's 101st day at work on the Martian surface. Stitching a sequence of images by the lander's Instrument Deployment Camera (IDC) shows the splendorous sun setting over the Red Planet and disappearing beyond the horizon. Talks in this article about what options they are considering with the mole. Engineers are still trying to understand why one of the main instruments on NASA’s InSight Mars lander is stuck just below the Martian surface. A blue box, a cubic metre of Mars-like sand, a rock, a fully-functional model of the Mars 'Mole' and a seismometer – these are the main components with which the German Aerospace Center (Deutsches Zentrum für Luft- und Raumfahrt; DLR) is simulating the current situation on Mars. After its first hammering operation on 28 February 2019, the DLR Heat and Physical Properties Package (HP³), the Mars Mole, was only able to drive itself about 30 centimetres into the Martian subsurface. DLR planetary researchers and engineers are now analysing how this could have happened and looking into what measures could be taken to remedy the situation. "We are investigating and testing various possible scenarios to find out what led to the 'Mole' stopping," explains Torben Wippermann, Test Leader at the DLR Institute of Space Systems in Bremen. The basis for the scientists' work: some images, temperature data, data from the radiometer and recordings made by the French Seismic Experiment for Interior Structure (SEIS) during a brief hammering test conducted on 26 March 2019. When the NASA InSight lander arrived on the Martian surface, everything looked even better than expected. Although the lander's camera showed numerous rocks some distance away, the immediate surroundings were free of rocks and debris. The reason why the 'Mole' hammered its way quickly into the ground after being placed on the surface of Mars and was then unable to continue its progress is now being diagnosed remotely. "There are various possible explanations, to which we will have to react differently," says Matthias Grott, a planetary researcher and the HP³ Project Scientist. A possible explanation is that the 'Mole' has created a cavity around itself and is no longer sufficiently constrained by the friction between its body and the surrounding sand. In Bremen, DLR is now experimenting with a different type of sand: "Until now, our tests have been conducted using a Mars-like sand that is not very cohesive," explains Wippermann. This sand was used during earlier tests in which the 'Mole' hammered its way down a five-metre column in preparation for the mission. Now, the Mole's ground model will be tested in a box of sand that compacts quickly and in which cavities can be created by the hammering process. During some of the test runs, the researchers will also place a rock with a diameter of about 10 centimetres in the sand. Such an obstacle in the subsurface could also be the reason why the HP³ instrument has stopped penetrating further. In all experiments, a seismometer listens to the activity of the Earth-based 'Mole'. During the short 'diagnostic' hammering on Mars, SEIS recorded vibrations to learn more about the Mole's impact mechanism. Comparisons between the data obtained on Mars and the Earth-based tests help the researchers more closely understand the real-life situation. "Ideally, we will be able to reconstruct the processes on Mars as accurately as possible." The next steps will follow once the scientists know what caused the progress of the 'Mole' to come to a halt on 28 February 2019. Possible measures to allow the instrument to hammer further into the ground must then be meticulously tested and analysed on Earth. For this reason, a replica of the HP3 instrument has been shipped to NASA's Jet Propulsion Laboratory in Pasadena, California. There, the DLR researchers' findings can be used to test the interaction of the 'Mole', the support structure and the robotic arm to determine whether, for example, lifting or moving the external structure is the correct solution. "I think that it will be a few weeks before any further actions are carried out on Mars," says Grott. The break in activities for the Mars Mole will only come to an end once a solution has been found for the Earth-based 'Moles'.